An independent trader who planned to run a stall in Dundee Indoor Market claims he has been left thousands of pounds out-of-pocket by the blaze that destroyed the building. 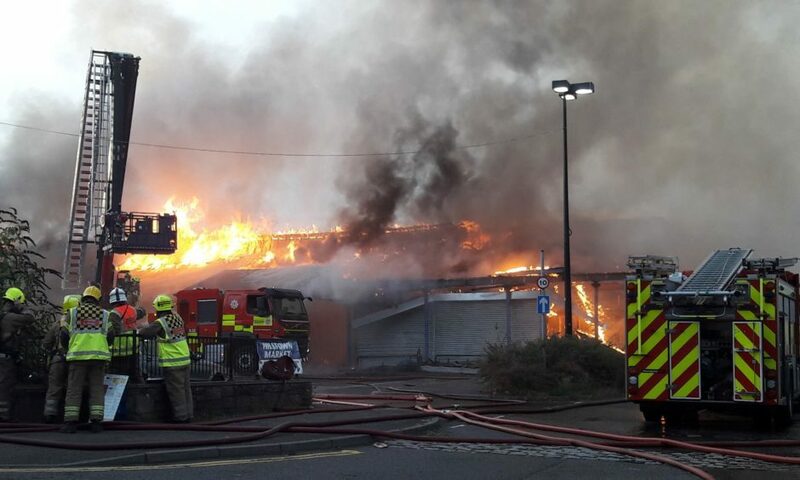 Hilltown Indoor Market and the neighbouring Fit4Less gym were destroyed after the fire on September 12. Fire crews tackling the Hilltown blaze. The market closed in December 2016 but was about to re-open as home to the charity the Tayside Furniture Re-Use Network, which refurbishes unwanted furniture so it can help those in need. The charity also wanted to pay for its upkeep by renting out stalls to individual traders. However, the devastating fire has left those storing goods in the market in anticipation of it re-opening, thousands of pounds out of pocket. Kenneth Hill, who volunteers at the Tayside Furniture Re-Use Network also planned to run a small stall selling antiques and collectables. He said: “Around £50,000 to £60,000 worth of furniture and collectables must have been lost. “I was going to be renting a small stall but we didn’t have insurance. I lost my own home to fire a few years so was storing a lot of personal possessions there too. “There is a lot of water damage and smoke damage so we don’t know what can be saved. A spokesperson for the Tayside Furniture Re-Use Network said the charity is now seeking new premises but may struggle to find a building large enough. The spokesperson said: “It’s been a major setback. A lot of the stock was damaged and the stuff that isn’t fire damaged is smoke or water damaged so will be very little to salvage if anything. Anyone who is able to help find a new home for the charity should contact Kenneth Hill on 07984457034. Tayside Furniture Re-use Network was set up last year. With about 10 million household items sent to landfill every year in Scotland, the charity estimates three million items could be re-used by people in crisis. The Tayside Furniture Re-use Network will try to help reach vulnerable people in crisis by gathering old items in the region and making them available for those in need. An investigation into the cause of the September 12 blaze is ongoing.